If there’s one thing that truly fascinates me its building works. This is not just the anticipation for something new and unknown rising from the rubble; it is the aesthetic of the transformation itself. Often the transformation is more beautiful than what was there before and what is there afterwards. This transition period is rarely still, yet once complete the aesthetic will then remain constant for years. What better way to capture this brief spell of activity and give it importance it would not normally be granted than in a painting? The development of Luton’s main shopping area “The Mall” is depicted here. The beautiful carnigue library was sadly lost some years ago to a rather dull office building which also housed a poundstretcher store. Both this building and Williamson Street which the building used to sit on have given way to this extension of the mall. The new building will go on to house a new TK Maxx and a costa coffee. I have many photos of various facets of demolition and construction but this one really stood out, I had to straighten the uprights, and loose the odd bollard but the composition was basically there in the shaky i-phone photograph which this image is based upon. I like the three points of interest in the composition. These are the orange cradle, the yellow belisha beacon and the man pushing the push chair. 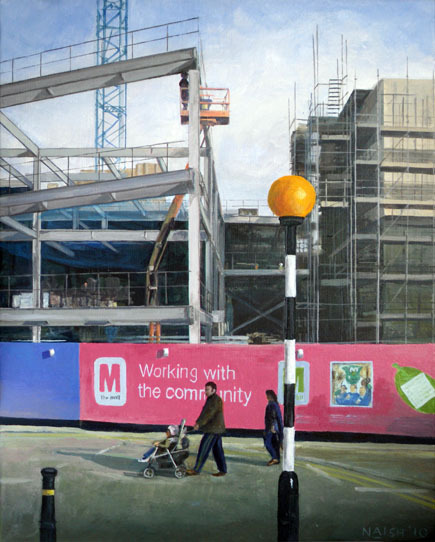 I also like the sub-plot of the man in the cherry picker almost hiding behind the steel structure and the pink wall being a barrier to the public while proclaimimg in all its branded finery that it is somehow working with that community that it is hiding away from. This is one of my favourite paintings of mine – perhaps a little cold and formal; and yet somehow abstract while not being abstract attall.